Like song birds, frog species each have a distinctive call that males use to attract females to breeding areas. They will emerge from hibernation and start calling shortly after the frost leaves the ground. Some will breed in temporary woodland pools or farm field ‘potholes,’ some only inhabit lake edges and river backwaters, still others will be found in marshes or other perpetually wet areas. Their unmistakable calls can help you hone in on their breeding habitats. 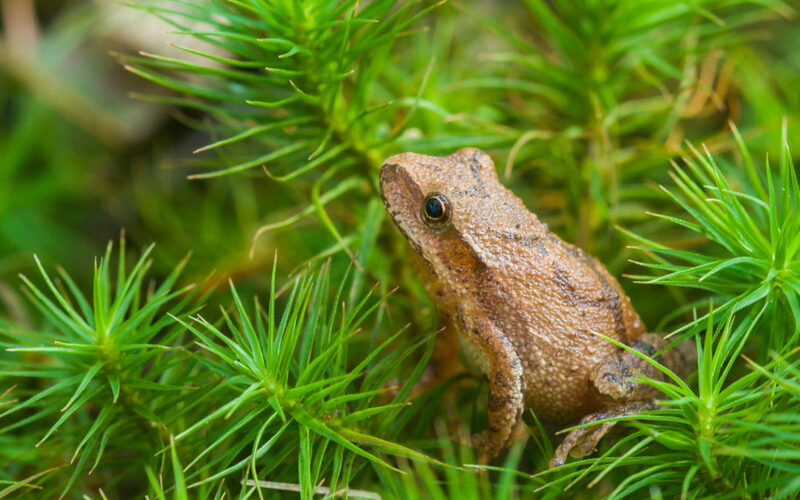 Once water temperatures reach 50°F, chorus frogs begin to sing. Listen for a call that sounds a bit like a fingernail running across the teeth of a plastic comb. 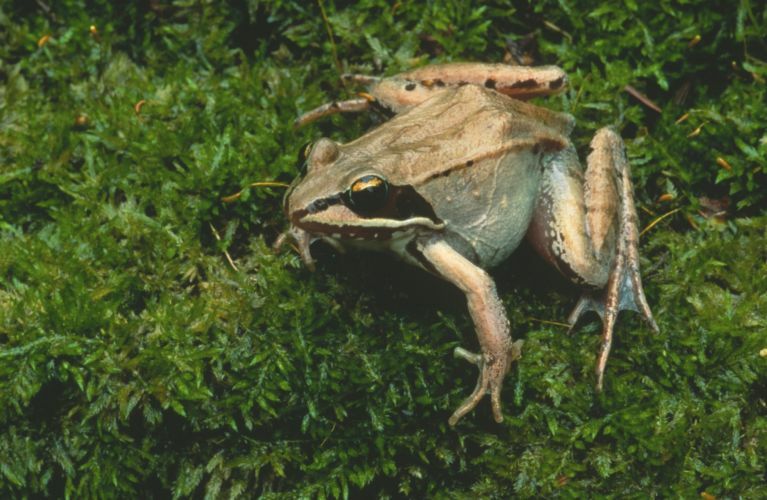 Shortly after the chorus frogs begin, northern leopard frogs, spring peepers, and wood frogs join in. Later in the spring, around the time water temperatures hit 60°, the trilling of American toads and gray treefrogs can be heard. Green frogs, mink frogs, and bullfrogs start croaking in the very late spring and early summer when the waters warm to about 70°. The outcome of this cacophony is massive, frenzied breeding. Finding and identifying the resulting egg masses can add to your wetland enjoyment. The eggs of Wisconsin frogs are moderately-sized with a creamy yellow or pale grayish yellow yolk surrounded by a thin membrane and one or two gelatinous capsules, depending on the species. Eggs that are exposed to direct sunlight develop dark pigment on the exposed side, protecting the developing embryo from ultraviolet radiation. This adaptation also might let eggs absorb heat faster and stay warmer longer, allowing them to develop more quickly than those laid in colder, deeper waters. The gelatinous masses surrounding the eggs often appear greenish as algae grow in the membranes. In general, larger species have more eggs than smaller ones. Large bullfrogs can lay up to 20,000 eggs, while tiny gray treefrogs will lay as few as 10. Leopard frogs and pickerel frogs enclose many eggs in a single jelly mass. Spring peepers deposit their eggs singly. The American toad’s eggs and jelly are shaped in long, paired strings. Clumps of eggs are commonly attached to sticks or vegetation to hold their position in the water. Bullfrogs and green frogs lay eggs in a film on the surface of still, shallow waters where the eggs are better able to meet their oxygen needs. Adult frogs depart the breeding ponds after mating, leaving the eggs unprotected. The fertilized eggs will hatch into tadpoles that later metamorphose into young frogs. Eggs may hatch in a few days or take several weeks depending on the water temperature. The tadpoles which emerge feed voraciously. Most tadpoles metamorphose into adults after several weeks, while others take their time. Bullfrog, green frog, and some mink frog tadpoles take a year or more to develop into frogs. Many ecologists also view frogs as valuable indicators of environmental change. Since they spend part of their life in water and part on land, frogs are monitored to measure the effects of water, air, and land pollution. In fact, the Wisconsin DNR has coordinated a statewide frog and toad survey since 1981, the oldest such survey in the nation. Learn more about the survey at www.wiatri.net/Inventory/FrogToadSurvey/. 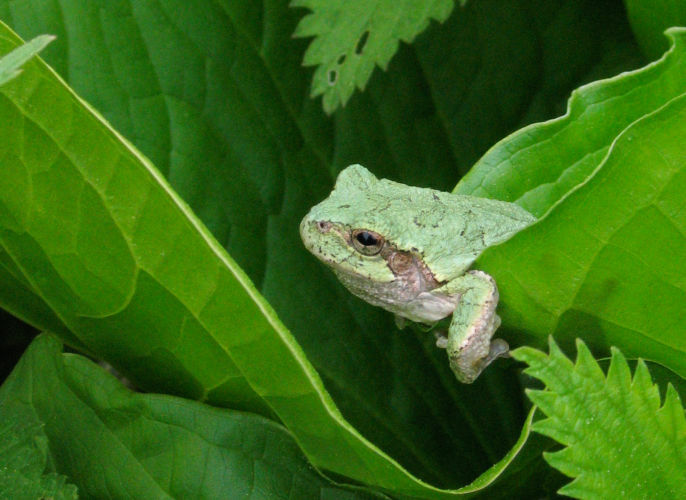 Media attention has helped raise awareness about declining amphibian populations. No single factor explains the losses, but habitat destruction, pollutants, competition from other species, and severe droughts all take a toll. In an ancient Greek play, an ominous chorus of frogs croaked “Brekekekex koax koax” as Dionysus rowed across the river Styx. That may sound like nonsensical babble, but a sudden, deathly silence from our wetland friends would send a much more sobering message. Fortunately, we in Wisconsin can still enjoy the springtime raucous that our wetlands provide.